NIB has provided a loan totalling EUR 147 million to the Hospital District of Helsinki and Uusimaa (HUS) to finance a new hospital project in Helsinki. The Bridge Hospital. Visualisation: HUS. The EUR 147 million loan will be used for the construction of the new Bridge Hospital (Siltasairaala) in Meilahti medical campus in Helsinki. The Bridge Hospital, the biggest construction project in the history of HUS, combines two hospitals into one hospital, bringing substantial efficiency gains through centralisation, streamlining and renewing the treatment processes. The new hospital will replace old trauma centre and other operations of Töölö Hospital and part of the Cancer Centre building. It will also be integrated with the other current operations at the Meilahti medical campus in Helsinki. 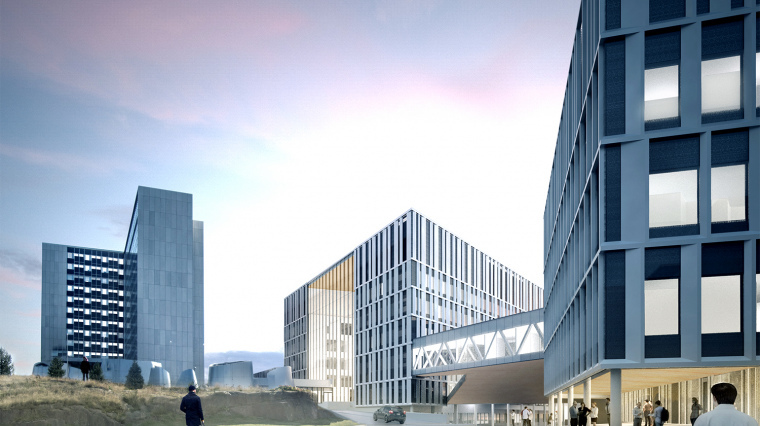 The Bridge Hospital will open in the beginning of 2023, and together with other units of Meilahti, it will become the largest and most advanced medical campus in Finland. Functioning as part of HUS, Helsinki University Hospital (HUH) is nationally responsible for treating severe and rare illnesses and ones calling for special expertise and technology. HUH has close co-operation in research and education with the Faculty of Medicine at Helsinki University, and consequently the new Bridge Hospital will provide good working conditions for academics. “With improved and modernised infrastructure, the new Bridge Hospital increases the treatment capacity in southern Finland where the demand for these services is significantly increasing. For patients, the new hospital will provide high-quality specialised medical care in a comfortable, safe and more easily accessible environment”, says Henrik Normann, President & CEO of NIB. HUS is a joint authority formed by 24 municipalities, the biggest ones being the cities of Helsinki, Espoo and Vantaa, with a share of around 65%. HUS is responsible for specialised medical care services in Southern Finland. It is the largest hospital district in Finland, serving 1.6 million inhabitants, and also the second largest employer in Finland, with a staff of around 24,000 people.